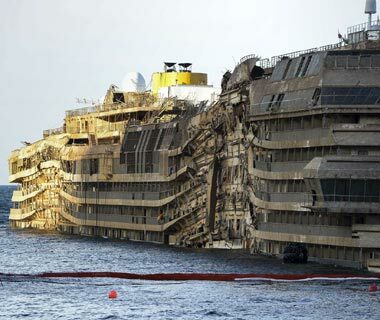 Divers find remains on the ocean seabed next to Costa Concordia. On Thursday divers found two bodies laying on the seabed near the central part of the hull. The divers had been searching the vessel for two missing people ever since the parbuckling operation had completed. An Indian crew member and an Italian passenger have been missing ever since the Costa Concordia hit a rock near the Italian island of Giglio and then partly sinking where 32 people sadly died. The event happened back in January 2012. Officials from the scene have reportedly said that the two bodies which have been found are very consistent with the two remaining missing people from the ship. A DNA test is set to take place to officially identify the bodies. Relatives of the two missing people have been notified which will finally bring closure to them. The bodies are expected to be removed soon. It was thanks to the huge salvage operation to upright the Costa ship which made finding the two remaining bodies possible.